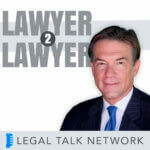 Legal Talk Network had a jam-packed year filled with new episodes from some of your favorite shows and more conference coverage than ever before. We covered the 2017 ABA Annual Meeting, Clio Cloud Conference, and the MIT Legal Forum on AI and Blockchain just to name a few. Whether you’re an avid listener to the network or just happened upon this article, scroll through this list and you’re sure to find something that piques your interest. These are our 2017 fan favorites on topics like technology, practice management, and, of course, the Trump administration. So while your chestnuts are roasting on an open fire, tune into Legal Talk Network’s most played episodes of 2017. How can lawyers fight implicit bias? Jeffrey Rachlinski, a Cornell Law School professor who has done various studies about implicit bias, discusses the ways bias can creep into law and his study that focused on the bias of trial judges. At 69, Legal Rebels Trailblazer Judge Herbert Dixon still proselytizes about high tech in courthouses and courtrooms and predicts its future. Harper Lee Prize-winning author Paul Goldstein discusses his new novel “Legal Asylum: A Comedy” which asks: Can a school make it into the exalted realm of the U.S. News Top Five and lose its accreditation, all in the same year? Lee Bailey, defense lawyer in the O.J. Simpson case, discusses his most notable cases and the definition of proof beyond a reasonable doubt. Elie and Joe discuss the 2017 Above the Law law school rankings and the ATL methodology with special guest Brian Dalton, Above the Law’s Director of Research. The CEO of GlobalMac IT discusses how cybercrime has evolved and what Mac using lawyers can do to protect their information, including using a password manager and investing in mobile device management. Tom Bruce, co-founder of the Legal Information Institute (LII), talks about what the LII is and how it has adapted to changing technology, including using natural language processing techniques to identify defining terms in regulations and statutes and linking together related subjects. ACLU advocacy and policy counsel Jonathan Blazer and FAIR director of research Matthew J. O’Brien debate and discuss immigration reform and the status of sanctuary cities under the Trump administration. Jordan Furlong explains why law has become a “buyers market” and how lawyers can take advantage of the opportunities presented by that market by becoming client-centered law practices. Ben Schorr, senior content developer at Microsoft, talks about the different tools Microsoft provides and how they lend themselves to a successful law firm. Tiana Russell, Kristen Anderson, and Lisa Phelan discuss issues pertinent to women who practice antitrust law including how office diversity has increased and what opportunities government roles can offer women. Northwestern Law faculty members Deborah Tuerkheimer, Andrew Koppelman, and Eugene Kontorovich talk about President Trump’s actions and the legal considerations facing his administration. Brett Bartlett, partner with Seyfarth Shaw in Atlanta, shares insights on the possible implications for corporate law departments, law firms, and the legal workplace during the Trump administration. Is Law Really A Buyer’s Market? And If So, Now What? Jordan Furlong talks about what has driven the shift to a consumer-focused market, the new players that are breaking onto the scene as a result, and how law firms, both big and small, should react to the changes. Richard Granat talks about what a virtual law practice looks like, the major drivers in the switch to online services, and the learning requirements of making your own practice a virtual one. Retail Expert Jerry Birnbach discusses what companies and defense attorneys need to be concerned about regarding slip and fall accident claims. 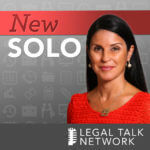 This legal podcast discusses the advantages of video conferencing for lawyers including how lawyers are using video chatting, important security aspects, and what reliable software is out there to try. Michael Chasin, CEO of Lexicata, talks about how effectively managing your practice’s client intake process can be the difference between a good law firm and an exceptional one. Adam Camras, CEO of Legal Talk Network, talks about managing your law firm’s time effectively by taking advantage of technology and apps, like Google Express and Uber. Vikram Rajan, co-founder of PhoneBlogger.net, lays out the four Cs of referability (credibility, customer service, content, and connections) and talks about how to get and use testimonials. Alex Lonnett talks about third party liability waivers in employee contracts, how both insurance companies and lawyers are reacting to them, and how rights waivers are affected by a modern workforce. If you liked these there’s more where that came from! Listen to your favorite Legal Talk Network shows on Apple Podcasts or your podcast app of choice. Sam graduated from Hope College in May 2016 and has just recently emerged into the online marketing world via Lawgical. She likes dogs, cameras, and short walks on the beach because she burns easily.